A tenkeyless plank with Romer-G switches. 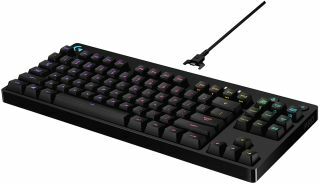 Logitech on Tuesday introduced a new tenkeyless mechanical keyboard called the G Pro that it says was developed in collaboration with top esports players and is purpose-built for professional competition. That sounds like marketing hype, though according to Logitech, "extremely picky and demanding" esports athletes really did have a hand in developing the G Pro through their collective feedback on earlier designs. "We give them access to our prototype designs early and often, and let them rip 'em apart. The result is the Pro Gaming Keyboard with ultra-fast switches, durable construction, and a tenkeyless design that's easy to transport. If you play to win, this is your keyboard," Logitech says. Make of that what you will. Beyond the marketing claims is a compact keyboard that uses Logitech's own Romer-G mechanical switches, which it sources from Omron. Romer-G switches have a short-throw actuation point of 1.5mm and register key presses up to 25 percent faster than standard mechanical key switches, Logitech says. As for durability, they're rated for 70 million keystrokes. The focus here seems to be on the space saving design and ease of travel. In addition to being a tenkeyless plank, Logitech touts a detachable micro-USB cable. The advantage there is that it won't break at the point of connection when stuffing it into a backpack and heading to an esports competition. "This is a great keyboard because it's small, durable, and tenkeyless. This allows me to have more space on my table," said Cloud9’s Jake 'Stewie2K' Yip. "The Romer-G switches are nice and quiet, and they're super comfortable to type on." What it lacks are some gaming amenities found on some of Logitech's other keyboards, such as dedicated macro keys, a built-in LCD, or a dock for mobile devices that can serve as a secondary display. In lieu of those things, the G Pro features customizable RGB lighting and the ability to create macros for the programmable F1-F12 keys. The Logitech G Pro is available now for $130.